Use these techniques to remove unwanted aerosol paint from concrete, metal—even skin—quickly and easily. 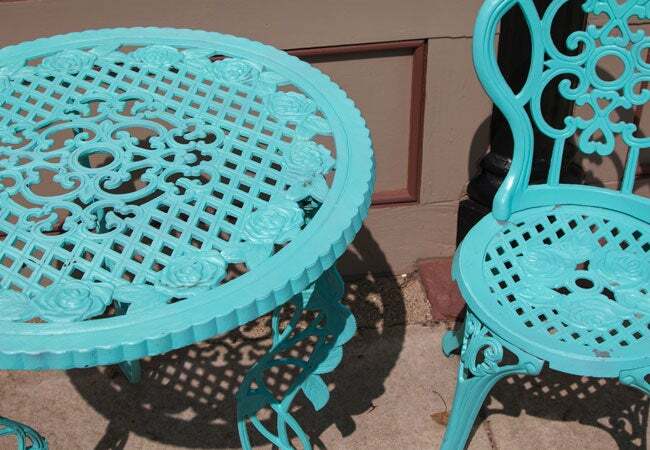 Do-it-yourselfers love spray paint as a fast, fun way to complete projects or breathe new life into tired décor. Accidents happen, though—usually when that blast of color strays outside its intended area, leaving you with stray streaks on surrounding surfaces like your concrete driveway, metal hardware, or your own skin. In any of these cases, water alone usually isn’t enough to remove the errant paint unless you’re quick enough to wipe it off while it’s still wet. This is because the binding agents in water-based paint fuse together and harden as the paint dries, making it more resistant to water. 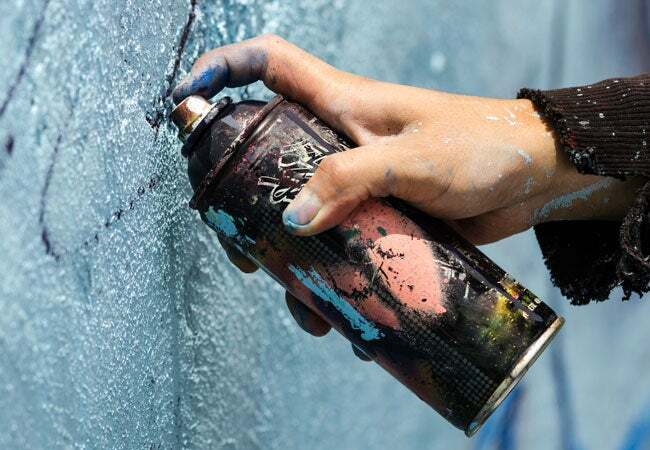 Dried oil-based spray paint is even more difficult to remove because the natural oil or alkyd (resin) binding agents it contains don’t dissolve in water. 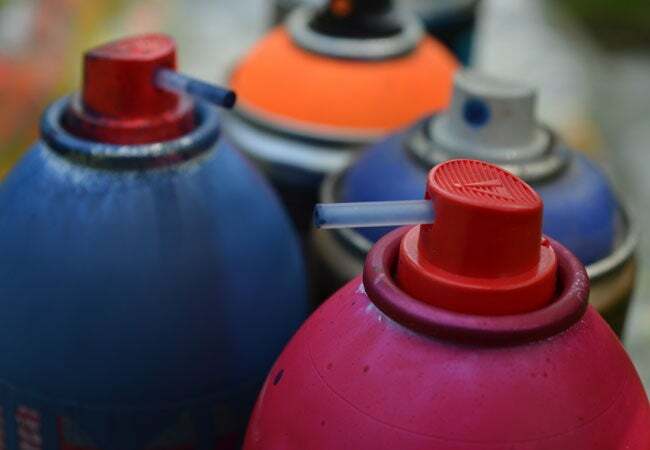 Whether you’re dealing with overspray or you’ve changed your mind on a recent paint job, read on for the proper techniques and cleaning agents necessary for how to remove spray paint—they’ll undo the damage in a jiffy. Remove water- or oil-based spray paint from your hands and other exposed areas with a little elbow grease and a few natural, non-toxic household products you no doubt already have on hand. Consult the canister if you’re not sure if you’re dealing with water- or oil-based paint. To loosen water-based spray paint from your skin, start by squeezing a quarter teaspoon of liquid dish soap over stained areas and gently rubbing it in with your other hand for two minutes using circular motions. Wet the bristles of a clean toothbrush under hot (but not scalding) tap water and then gently work the brush over the soap-covered areas for two minutes to scrub off any remaining paint. Rinse with warm tap water. If removing oil-based spray paint from your skin, wet stained areas with several drops of pure essential oil, which can dissolve oil-based paint (remember your chemistry class principle of “like dissolves like”). Massage the oil into the stains to loosen the paint. Avoid touching your eyes while working with essential oil—it packs a sting. Rinse with the warm tap water to wash away remaining paint residue. If needed, re-apply the essential oil to the skin and rinse again with warm tap water until all paint is gone. Dab the skin dry with a clean cloth, and wash your hands to remove any lingering oil. Concrete is porous and readily absorbs spray paint, so you’ll need some heavy-duty supplies and materials to remove it. 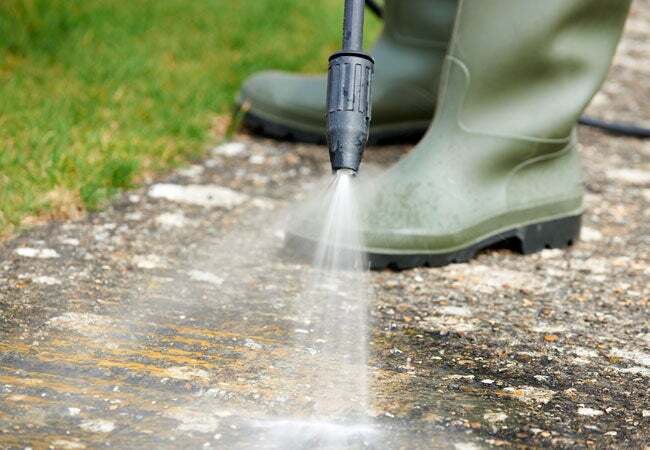 Two techniques—power washing and cleaning with trisodium phosphate (TSP)—can banish splatters and streaks from exterior or interior concrete surfaces like patios, driveways, and basement floors. Power washing, which entails blasting the stain away with a powerful jet of water from a pressure washer, should be reserved for outdoor stains of any size since it can soak and damage indoor structures like walls, insulation, and wiring. TSP can be applied to paint-stained concrete, indoors or out. But the technique requires manually scrubbing and is more labor-intensive than power washing. So if you have access to a power washer, limit the TSP technique outdoors to small stains. The easiest method for how to remove spray paint stains of any size from outdoor concrete is to rent a pressure washer. Connect its high-pressure hose to the high-pressure inlet on the washer; connect your garden hose to the water inlet on the washer. Outfit the spray wand on the spray gun connected to the pressure washer hose with a 15-degree spray nozzle. Note: The smaller the angle of the spray nozzle, the narrower and more intense the jet stream. A spray nozzle with an angle greater than 15 degrees blast a wider, gentler stream of water that isn’t strong enough to remove paint, while a spray nozzle with an angle of less than 15 degrees blasts a more forceful jet of water that increases the risk of damage to underlying concrete. A 15-degree nozzle offers the intensity needed to remove spray paint without damaging concrete. After donning safety goggles, turn on the water supply and, standing between three to four feet from the stained area, start the pressure washer. Blast water over the stained area with sweeping back-and-forth motions. Within 10 to 15 seconds, the powerful water stream should force the spray paint from the concrete. If it fails, move one foot closer to the stained concrete and spray it again, but position yourself no closer than one foot from the surface to prevent water from ricocheting off the surface and onto your face. For stains of any size indoors, or for small outdoor stains (six inches or less in diameter), head to a well-ventilated area and put on gloves, safety goggles, and a respiratory mask. Dilute a half-teaspoon of TSP in two gallons of warm water in a five-gallon bucket. Dunk a stiff-bristle brush into the TSP solution and then vigorously scrub the stained concrete to loosen the paint. If the paint doesn’t come away immediately, let the TSP dwell on the concrete for 20 minutes, then scrub it again. For outdoor concrete, hose down the cleaned area; for indoor concrete, rinse paint debris with a mop and plain water. Dry indoor concrete with a cloth or a dry mop. Because metal is non-porous, it’s fairly easy to remove spray paint from metal door hardware, tools, countertops, or patio furniture with a few inexpensive cleaning solvents. For small metal objects, cover the base of an old pot you no longer use with a ⅛-inch layer of baking soda. Then fill the pot halfway with cold water. Set the stained metal object inside the pot, then let the water simmer on the stove over low heat for 30 minutes. The combined action of the heat and the abrasive baking soda will cause the paint to loosen and bubble up on the surface of the object. Retrieve the object from the water using metal tongs and set it on a clean surface. While the object is still warm (but cool enough to touch), use a paint scraper to gently peel off the loosened paint, taking care not to scratch the object. For larger metal objects or surfaces, don gloves, safety goggles, and a respiratory mask. Brush a thin layer of chemical paint stripper over the stained area of the metal object using a chip brush. Let the paint stripper set according to the manufacturer’s instructions, then gently slough off the loosened paint with a stiff-bristle scrub brush. If paint remains, repeat Step 4. Wipe down the clean metal with a cloth dampened with mineral spirits to remove any remaining paint flakes and paint stripper. Dry with a clean cloth.